A giant serve of culture with your casual, courtyard consumed Caribbean food and drink. I think my bicycle, Nemo, goes on auto-pilot to Ciudad Movil. Nemo always knows what's best for me. He knows this vibrant community space in Getsemani is where I need to be for dance, exercise, music, art and really tasty food. It's the perfect default option whatever the occasion. It's a huge space made up of a distinct areas: at the entrance is a tiny store (Mico al Hombro) filled with funky fashion, jewellery, art and gifts; next up a display space for art exhibitions; then the studio; finally the lush, tree-filled courtyard complete with bar and restaurant. The rotation of daily activities offers something for everyone every day of the week. Regular classes of zumba, yoga, salsa, capoeira and breakdance are spliced with special workshops ranging from poetry, photography to meditation, with weekend workshops designed especially for children. Be sure to check out What's On for the full schedule. 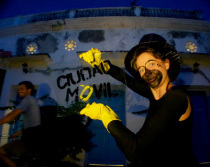 Ciudad Movil is also where you want to go for the most diverse live music and dance acts. Their concerts cover the whole spectrum of folkloric and world music - cumbia, rock, funk, afro, champeta, jazz, together with contemporary dance and ballet.. and on those rare occasions there's no live act scheduled, the house DJs definitely know how to get the punters moving. The vibe here is really varied. A little hippie. A little local. A little international. But always a lot of fun. The best part is that with every drink or cover you buy, you're supporting the local community of Getsemani and the ongoing initiatives that the people of Ciudad Movil offer to further enrich their neighbourhood. Whether it's to get sweaty in the thrice-weekly Zumba class, develop some salsa skills at the Tuesday night exchange, chow down on that delicious brioche, or catch the best Colombian music; somehow Nemo is parked out front of Calle Espiritu Santo most days of the week. If you're in Cartagena for any amount of time at all, you should set your auto-pilot to this place out too.